Gloria Kaberia (Kenya), a UNV Associate Community Services Officer in Sri Lanka, tells us what motivates her to volunteer during her free time at the Karuna Nivasa home for elderly and mentally ill women. Trincomalee, Sri Lanka: When I was in high school in Kenya, I participated in various volunteer programmes for palliative care centres and hospitals as part of my studies (I needed to complete 500 hours). This instilled in me a set of values that compelled me to act on deeply held beliefs about the importance of helping others. At the beginning it did not feel voluntary as it felt like an obligation. However, with time I owned the values and felt the need and urge to volunteer to better my community. Values I hold to date. Volunteering not only helps and benefits one’s community but, in a way, it benefits the volunteers themselves. When one volunteers, one serves others without expecting to get anything from the service. I believe that everyone should give back to their community because volunteering will make your community a more comforting and pleasing place to live in. Every Sunday, when I am off duty as a UN Volunteer, I volunteer my services at the Karuna Nivasa home for elderly and mentally ill women in Trincomalee. 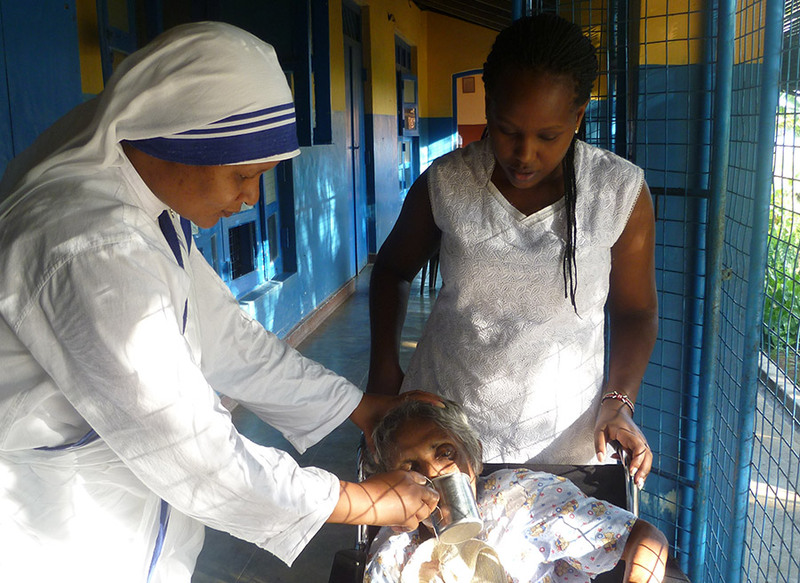 The home is run by the Mother Teresa Sisters. Some of the sisters have training in various medical courses but they are not specialized in mental health care. However, the Ministry Of Health provides trained personnel and medication for the over 60 patients at this facility. Many people support this home with food, clothing, cleaning materials and many other things that keep it running. (It’s run on people’s good will). I chose to volunteer at this home because I thought my mental health care background might be of great value here. And it has been mutually beneficial even though I don’t speak the local language. I enjoy volunteering here because of the genuine smiles and hearty laughter with which the patients reward me for the little things I do for them. It might be my feeding them, making their beds or giving them my undivided attention when they speak to me. Simple things, such as witnessing them seeing their own image on a digital camera when I take their photo, makes the time spent here worthwhile. My volunteering also relieves the nursing sisters from small tasks I can do that they don’t have time to do, such as typing, printing and laminating. Most of the patients at this facility are bedridden, in wheel chairs or incapacitated in one way or another and in need of close supervision. Some do not have family members to visit them or homes to go to as they were picked up on the streets. There is need for additional help whenever possible and the sisters here are very receptive and happy to receive volunteers at all times. The spirit of volunteering is embedded in the local community which is very encouraging. People young and old and from all walks of life do come to the home to volunteer throughout the year. They feel there is need to. Attracted by the kind of work the home does, they volunteer for absolutely no remuneration and do not expect anything in return. I have asked some of them why they volunteer, and particularly, why here. They told me they had felt the cruel sting that life had dealt them through the loss of loved ones with a similar problem and they were looking to make life better for someone else and the community at large. Some people may find saccharine the thought of making the world a better place, but for me, it has been very fulfilling. It has given me the determination to keep volunteering wherever I go, improving the lives of the less privileged and making my community a better place. Volunteering challenges others around you, encouraging them to volunteer too, and eventually spreads the spirit of volunteerism far and wide!! Gloria Kaberia (Kenya) is a UNV Associate Community Services Officer in Sri Lanka.